Samsung is working hard to up the ante on cellphone camera resolution. But forget digital cameras. With their 8MP Omnia HD (spotted yesterday), Samsung is going after camcorders. The new Omnia HD features a 3.7-inch (360x640) screen, HSUPA, GPS, Bluetooth and either 8 or 16GB of storage along with an additional MicroSDHC slot. But what's more exciting about this Symbian phone is that it features an 8MP camera (complete with the works like smile detection) and the ability to shoot 1280x720 video at 24fps. You can even do some light editing to the clips before playing them right off the Omnia HD onto your HDTV. The world of independent film just got a whole lot lamer or more awesome. We haven't decided yet. Barcelona, Spain, February 16, 2009 – Samsung Electronics Co. Ltd., a leading mobile phone provider, today unveiled its ultimate multimedia powerhouse with HD brilliance. 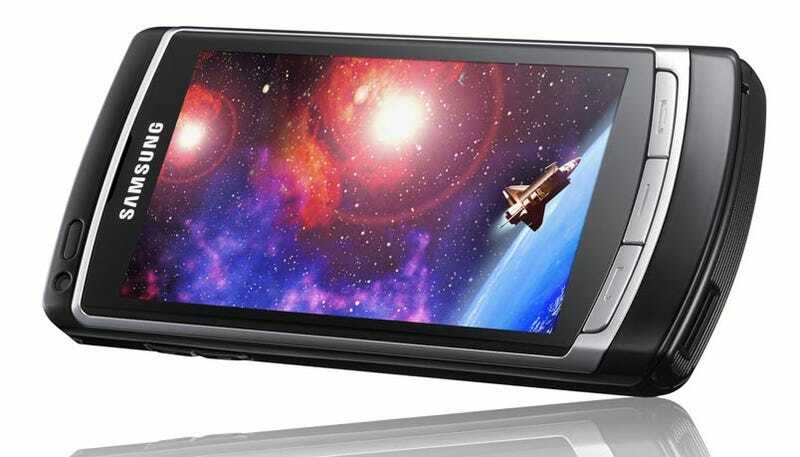 OMNIAHD is Samsung's first Symbian full-touch handset, and features the world's first 720P HD video recording and decoding on mobile, as well as the world's largest AMOLED screen on mobile. Samsung launches OMNIAHD at Mobile World Congress in Barcelona, as part of its portfolio of innovative mobile devices that incorporate the latest multimedia features and fastest data communication, to offer a complete media solution for consumers. Samsung OMNIAHD is the newest, high performance full-touch screen phone that brings together style, multimedia and business performance in one device. The mobile follows on from the phenomenal success and heritage of the OMNIA last year and extends Samsung's market leadership of all-in-one full-touch phones. Samsung OMNIAHD has a stunning design with a sleek finish and delivers the ultimate in digital entertainment thanks to its HD capability and 3.7" AMOLED screen. The Active Matrix Organic Light Emitting Diode (AMOLED) touch screen offers unrivalled sharpness of tone, vivid colours and greater clarity in direct sunlight as well as less power consumption. "Samsung OMNIAHD is an incredibly exciting product for us as it is a mobile perfectly suited to the needs of today's consumers who want exciting multimedia experiences on the move," said JK Shin, Executive Vice President and head of Mobile Communication division in Samsung Electronics. "OMNIAHDdemonstrates our vision for the Samsung mobile business, which is to provide premium phones for users who desire functionality, style, usability and entertainment in one innovative device. With Samsung Mobile, I believe that our users can enjoy being at the forefront of work and play, staying connected anytime, anywhere." Allied to the industry-leading 8MP camera which allows you take digital camera-quality photographs on your phone, the Samsung OMNIAHD ensures you capture the best possible photographs of your friends and family. GPS with integrated compass makes OMNIAHD suitable for both pedestrians and drivers, and the navigation touch control and voice guidance via dual stereo speaker provide drivers with easy and safe navigation. With its easy to use and intuitive 3D interface, OMNIAHD offers effortless and convenient viewing, allowing users to move around and multi-task seamlessly. Motion-enabled features including 3D games make it intuitive and exciting to enjoy the best ever mobile multimedia experiences. Moreover, Samsung Mobile Widget delivers up-to-date information of your choice with just one touch, creating a personalized interface with which to access the infinite wealth of web content.